You can purchase GAR genetics with confidence because we offer you the Gardiner Breeding Guarantee. 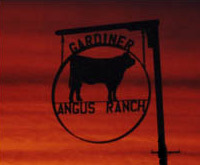 We guarantee that all breeding cattle sold by Gardiner Angus Ranch, both bulls and females, are fertile to the best of our knowledge. If a bull is injured at any time in the 12 months following the sale so as to make them functionally infertile, we will provide you with a satisfactory replacement (if available), or issue you a credit equal to the bull’s purchase price minus the salvage value received for that bull. If a female is determined to be a non-breeder, then we would ask you to sell her and would offer you the difference of her purchase price minus the salvage value as a credit in any future GAR sale. All credit is good until it is used and does not expire. We would simply ask you to contact us before you cull your infertile animal. This is not a life insurance policy, however. We will not replace a dead animal if it is killed or dies for any reason. We would suggest that normal care still needs to be exercised toward these animals and that particularly the yearling bulls not be allowed to get too thin. This guarantee is in addition to the Suggested Sale Terms and Conditions of the American Angus Association, which also apply.